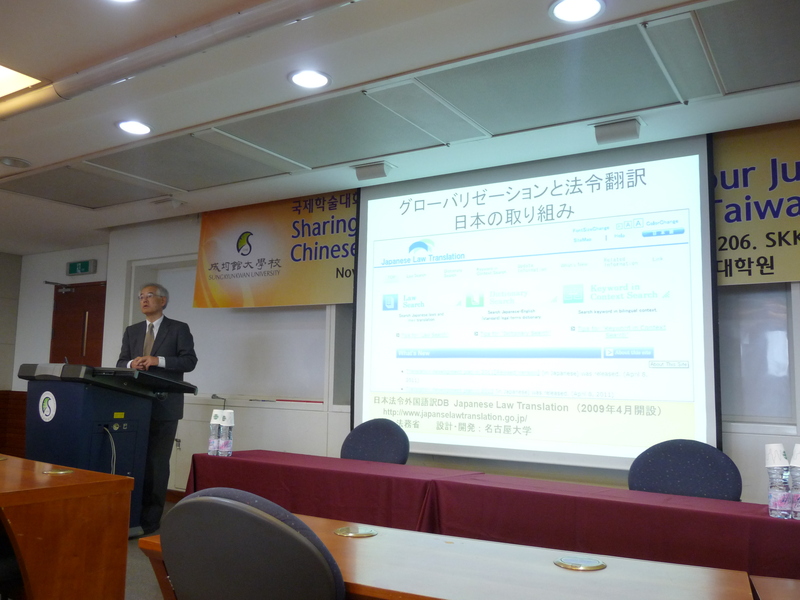 Designated Professor Yoshiharu Matsuura made a keynote speech titled “Creating the legal informatics” on the annual conference of the Information Network Law Association Japan. 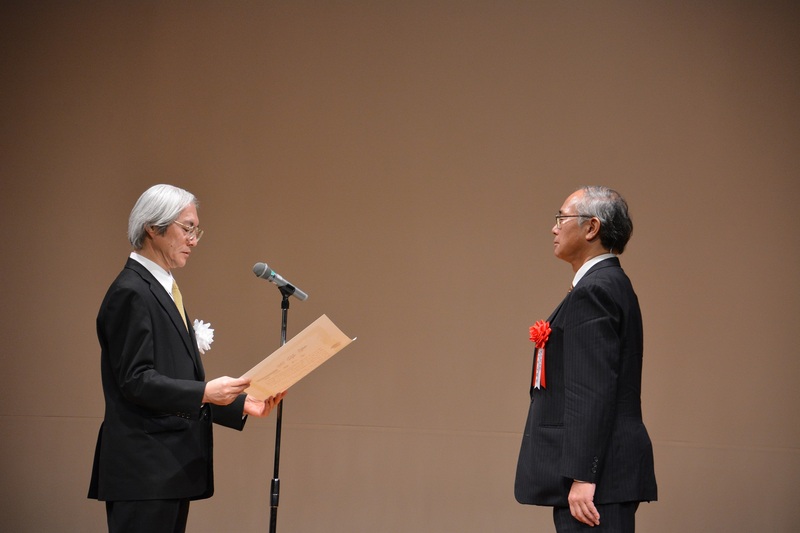 Professor Katsuhiko Toyama was received “Awards from the Minister of International Affairs and Communications, the FY2017 Program for Individual and Other Contributors to Promotion of Imformatization”. Professor Tomoko Masuda was interviewed and published the article in Shinano Mainichi Shinbun about an effect of the Meiji Restoration to Present Era. Designated Lecturer Tomoko Matsumoto and Professor Tetsuji Okazaki, Tokyo University made a presentation titled ”Change in Membership and Ranking of the Elites over Phases of Democratization” in the Workshop on the Frontiers of Statistical Analysis and Formal Theory of Political Science, Gakushuin University. Professor Masuda made a keynote speech titled “The Revision of the Constitution of Japan and the Emergency Imperial Ordinances of the Meiji Constitution” in Association of Historical Science 50th conference. Associate Professor Ogawa made a presentation titled ”Extraction of Bilingual Phrases from the Japanese Ofﬁcial Gazette, English Edition” in the Eighth International Conference on Knowledge and Systems Engineering (KSE 2016), Hanoi, Vietnam. Designated Professor Nakamura made a presentation titled ”Development of Diachronic Legal Terminology and its Application” in the Law via the Internet 2016, Cyprus. Associate Professor Nakamura made a presentation titled ”Diachronic and Synchronic Analyses of Japanese Statutory Terminology -Case Study of Gas Business Act and Electricity Business Act-“ in Workshop on Legal Text, Document, and Corpus Analytics, San Diego, U.S.A. Designated Professor Matsuura made a presentation titled “Method of Collaborative Communication for a Cross-cultural Comparison of Law and Society in a Glocalized Context” in Law and Society Association paper session on “A Study of the Child Right in the Context of Law and Society of East Asia: An Experiment of Cross-cultural Collaboration in Comparative Law”, New Orleans, U.S.A. Designated Professor Matsuura Yoshiharu made a presentation titled “Different Games of Law and Comparative Study — How to Achieve a Sense of Reality” in Renmin University of China Law School. Designated Professor Matsuura and Designated Associate Professor Nakamura made a presentations titled “CJKT Experience of Sharing Legal Language”, “Development of Japanese Diachronic Terminology and its Role in the CJKT Dictionary” in “Workshop on Comparing legal languages and creating common/uniform terminologies”, Bologna Italy. Ms. Sakamoto, Prof. Ogawa, Nakamura, Ohno and Toyama made a presentation titled “Utilization of Multi-Word Expressions to Improve Statistical Machine Translation of Statutory Sentences” in JURISIN 2015, Keio University. Mr. Kawachi, Prof. Nakamura, Ogawa, Ohno and Toyama made a presentation titled “Applying the Akoma Ntoso XML Schema to Japanese Legislation” at LVI2015, Sydney. 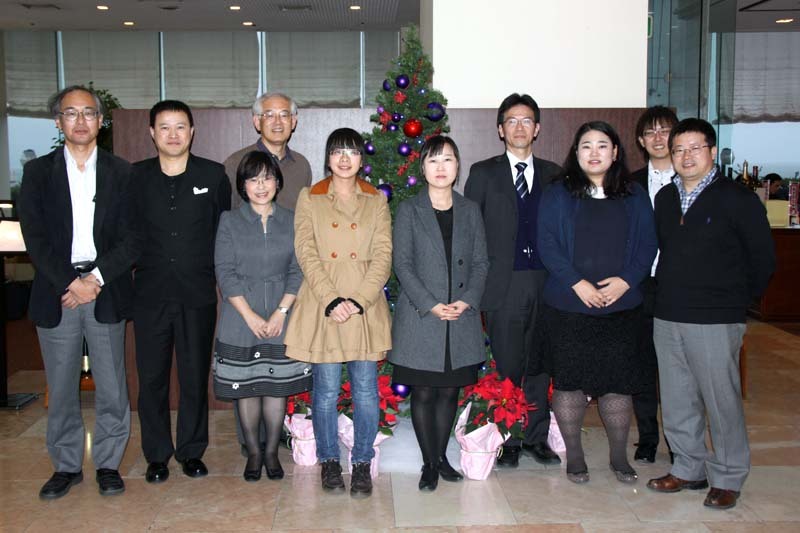 Prof. Matsuura, Toyama, Shee, Ding, Dr. Lee, Prof. Ogawa made a presentation titled “Development of CJKT Multilingual Translation Dictionary of Law” at LVI 2015. Prof. Nakamura, Ogawa, and Toyama made a presentation titled “Development of the Diachronic Terminology from a Japanese Statutory Corpus” at LVI 2015. Professor Matsuura, made a presentation at LVI2015 titled “Enhancing Comparative Law Scholarship in East Asia” with Prof. Shee, Director of TaiwanLII, and Prof. Ding, Renmin University Law School. the Outlines of Japanese Statutes by Splitting Parenthesized Expressions” in the seventh International conference on knowledge and systems engineering at Ho Chi Minh, Vietnam. “Supreme Commander for the Allied Powers Directives to the Japanese Government” is now able to be browsed in chronological order. Some pictures of the Official Gazette (English and Japanese Edition) of our digital archives are introduced in the book “現代語訳でよむ　日本の憲法 ” by ALC Press Inc. Professor Toyama gave a lecture titled “Support to the English Translation of Japanese Law” at the 6th symposium of Technical Japanese Association in Fukutake learning theater, Tokyo University. 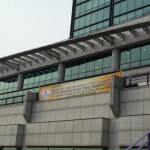 The CJKT Lawyers Meeting was held in Seoul. We visited the Ministry of Government Legislation and had a meeting about the research cooperation. 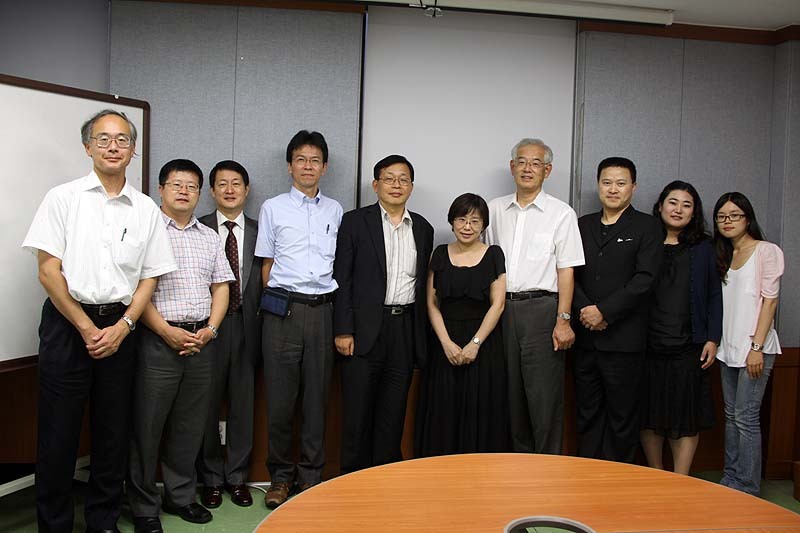 Professor Matsuura, Toyama, Associate Professor Ogawa and Assistant Professor Nakamura attended the International Expert Consultation Meeting: Taiwan Comprehensive University System: Regulatory Information Bilingual System, at National Chung Cheng University, Taiwan. Assistant Professor Nakamura and Professor Kakuta made a presentation titled “Development of the eLen Regulation Database to Support Legislation of Municipalities” in a joint Poster & Demo session, JURIX 2014. 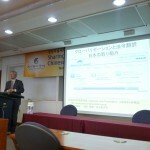 Professor Matsuura, Professor Toyama and Assistant Professor Nakamura joined the First Japan-Korea Joint Workshop on Juris-Informatics, and Professor Matsuura made a presentation titled “Development of An Environment to Share the Legal Information in More Accessible Way among Four Jurisdictions of East Asia”. 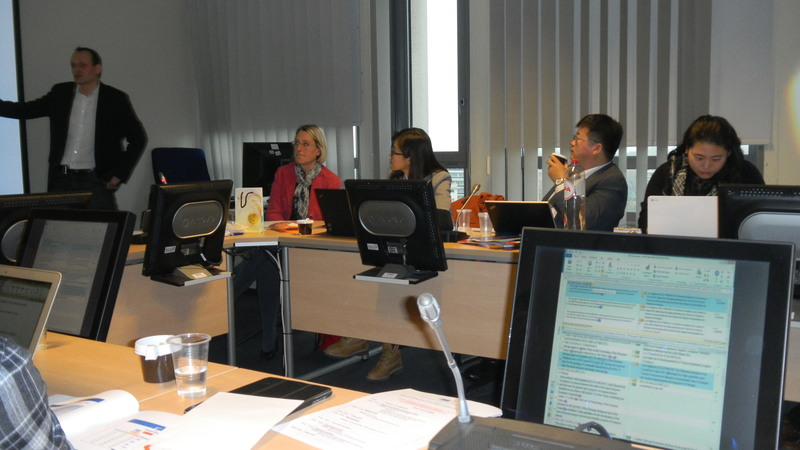 JaLII members and professors and researchers of China, Korea and Taiwan visited EU　DGT（Brussels）for an academic research of multilingual translation environment. Professor Matuura, Toyama, Ogawa and Nakamura as representatives of JaLII, Professor Ding and Ms Fang from Renmin University, China, Senior Researcher, Ms Lee from LIS, Korea Professor Shee, Hwang and Hsiung from National Chung Cheng University, Taiwan visited EU DGT and did an academic research about multilingual translation environment, machine translation in DGT. Maintenance Notice: Due to the power outage, our website will be temporarily unavailable during the period specified below. Day and time：November 16, 2014 (Sun.) 8:00 to 18:00. We apologize for any inconvenience this may cause and hope for your understanding. 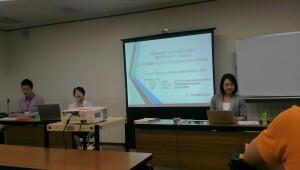 Professor Shima made a presentation about eLen at the seminar of Japan Special libraries Association. Dr. Yumi Miyazaki had a invited lecture titled 「コーパスを用いた法律用語の語義記述のプロセスと検討課題について」at a research workshop of JaLII. Professor Shima made a presentation titled “eLen databese for supporting legislative process of local government -a study how the databese should function from conduct hearings with staff of local government- ” in the 20th 自治体法務合同研究会, Kumamoto, Japan. JaLII hold a seminar of “eLen” at Liberal Democratic Central Politics Graduate. “eLen” is a name of databese which is loaded about 1 million ordinances of 1,580 local government in Japan.It is easy to search and compare the ordinances on this databese. JaLII sent the letter including ID and password for accessing the databese to administrative offices of the local council all over Japan in the first week of July. We appreciate your cooperation to this databese as a user. JaLII hold a workshop about the development for the standard translation dictionary of 4　jurisdiction, China, Korea, Taiwan and Japan and Law Pack at Sapporo, Japan. K Fukuda, K Toyama, A Noda「学内情報翻訳データベースの構築と運用 」win the price of 優秀論文賞 at Acadmic eXchange for Information Environment and Strategy 2013 Anuual Conference. JaLII makes a research contribution to this database. JaLII hold a workshop about the development for the standard translation dictionary of 4　jurisdiction, China, Korea, Taiwan and Japan and Law Pack at Tokoname, Japan. The 1624 laws (156,562 sentences) printed in “Official Gazette, English Edition” is now able to be browsed in Bilingual KWIC. “Statistical Machine Translation for Outlines of Japanese Statutes” INAGI Dai, OGAWA Yasuhiro, NAKAMURA Makoto, OHNO Tomohiro and TOYAMA Katsuhiko won a prize of 平成25年度電気関係学会東海支部連合大会奨励賞. Prof. Nakamura made a presentation titled ”Extraction of Legal Definitions and Their Explanations with Accessible Citations” in AICOL2013 workshop, Bolognya, Italy. International Expert Consultation Meeting: TCUS-RIBS Project was held at National Taiwan University and National Ilan University. 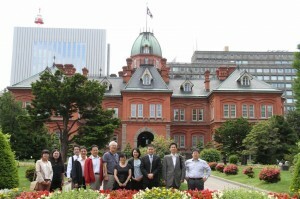 Prof. Matsuura, Prof. Toyama, Prof. Nakamura and Researcher Saito were invited and joined it. 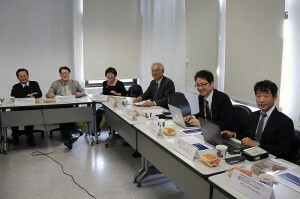 CJKT LawPack Lawyers Meeting was held at SKKU, Korea. Due to the power outage, our website will be temporarily unavailable during the period specified below. JaLII hold a symposium “Global Sharing of the Legal Information -Lessons from EU DGT”. 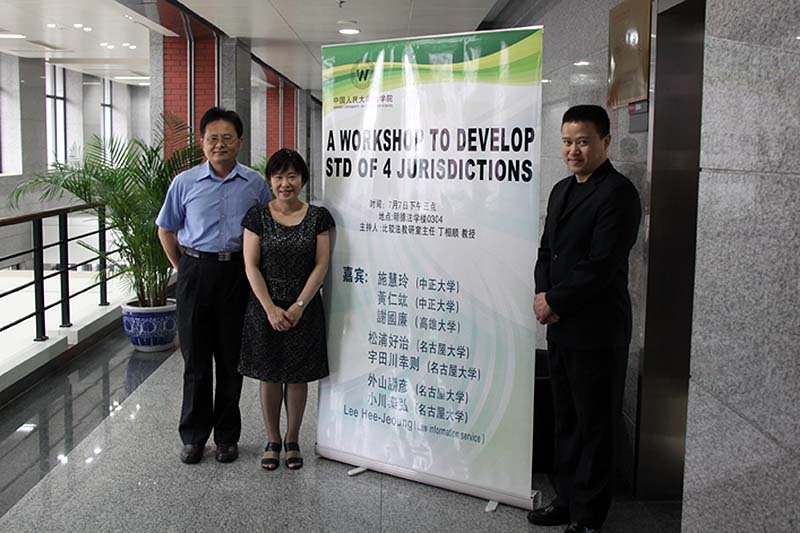 Please see the details from here..
JaLII hold a workshop about the development for the standard translation dictionary of 4 jurisdiction, China, Korea, Taiwan and Japan (CJKT) at Kaohsiung, Taiwan. Designated Assistant Prof. Nakamura, Associate Prof. Ogawa and Prof. Toyama made a presentation at the annual conference of the Association for Natural Language Processing. 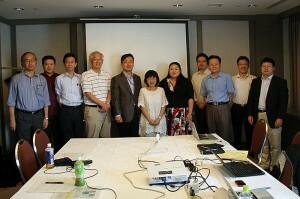 The first Law Pack Meeting was held at Caesar Park Hotel Kenting, Taiwan. Professor Shieh, dean for College of Law, National Taiwan University, Professor Shee, National Chung Cheng University and other 6 professors from Taiwan joined the discussion. 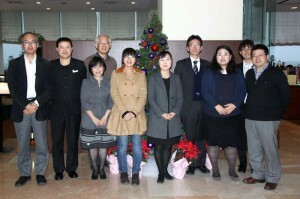 Ms Lee from Law Information Service, Korea also joined. Professor Matuura, Toyama, and Shima joined from JaLII side. 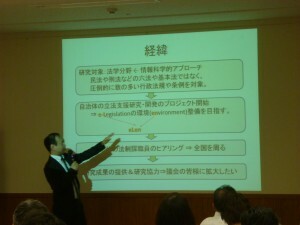 JaLII invited a lecturer from CABINET LEGISLATION BUREAU　and hold a seminar about legislative process. 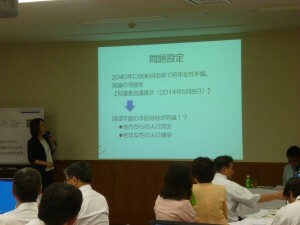 The member from JaLII and JATLAW joined the seminar and promoted better understandings to Japanese legislative process. 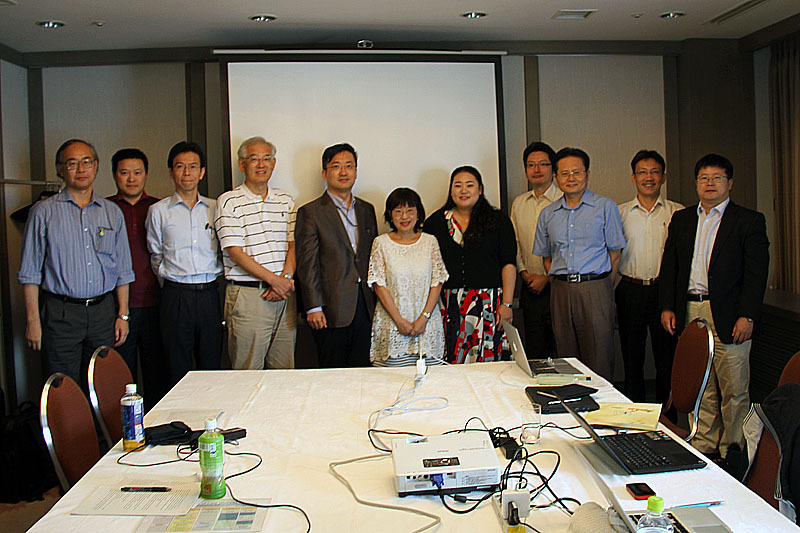 JaLII hold a workshop about the development for the standard translation dictionary of 4　jurisdiction, China, Korea, Taiwan and Japan at Kagoshima, Japan. Researcher Saito, Researcher Otani and Designated Assoc. Prof. Kakuta made a presentation titled “ eLen条例データベースシステムの紹介,” the 12th Study Meeting, the Information Network Law Association Japan at Institute of Information Security (Yokohama). Designated Assoc. 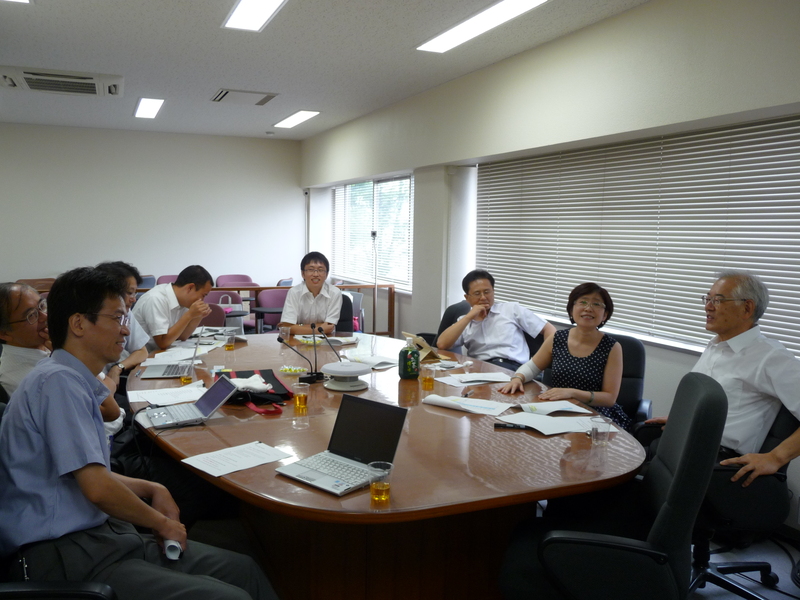 Prof. Kakuta and Designated Asssitant Prof. Shima made a presentation titled “立法支援のための全国自治体向け条例データベースの公開：e-Legislation推進とeLenプロジェクトの状況,” the 12th Study Meeting, the Information Network Law Association Japan at Institute of Information Security (Yokohama). A new website for the database (eLen) was opened. As to the news on the database, we will post them on this new website. →click on our new website. JaLII released a database of the ordinances to the local governments for the purpose of supporting their legislative process without compensation (on October 29). JaLII will mail announcement including how to use this database to all local governments. Professor Matsuura, Associate Professor Bennett and Mr. Sekine had a presentation titled “Making Legal Information Smart, Friendly and Inspiring”　“Uniform Tools for Legal Referencing ”　“The Development of Translation Memory Database System for Law Translation”　respectively at Law via the Internet 2012, Cornell University, U.S.A.
JaLII hold a workshop about the development for the standard translation dictionary of 4　jurisdiction, China, Korea, Taiwan and Japan at Law Information Service, Seoul Korea. JaLII hold a workshop about the development for the standard translation dictionary of 4　jurisdiction, China, Korea, Taiwan and Japan at Law School of Renmin University, China. 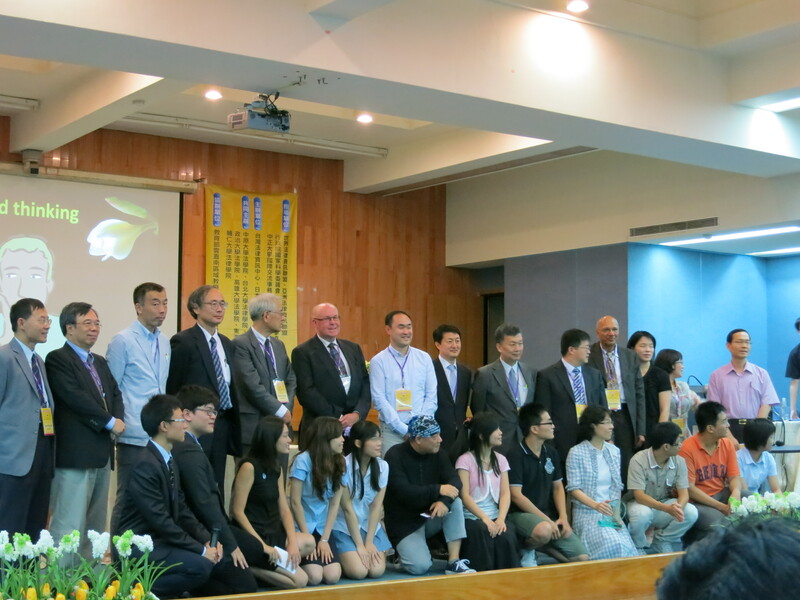 ”International Conference on Legal Information and East Asian Law: Theories, Practices and Prototypes” was co-organized by TaiwanLII and JaLII at National Chung Cheng University, Taiwan. 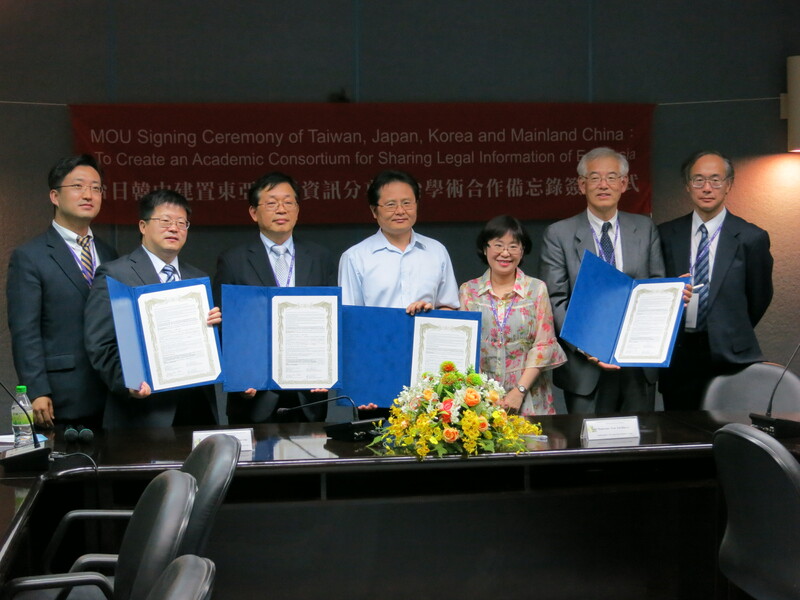 In the conference, counterpartners from Japan, China, Korea and Taiwan signed the memorandum to creat an Academic Consorttium for sharing Legal Information of East Asia. 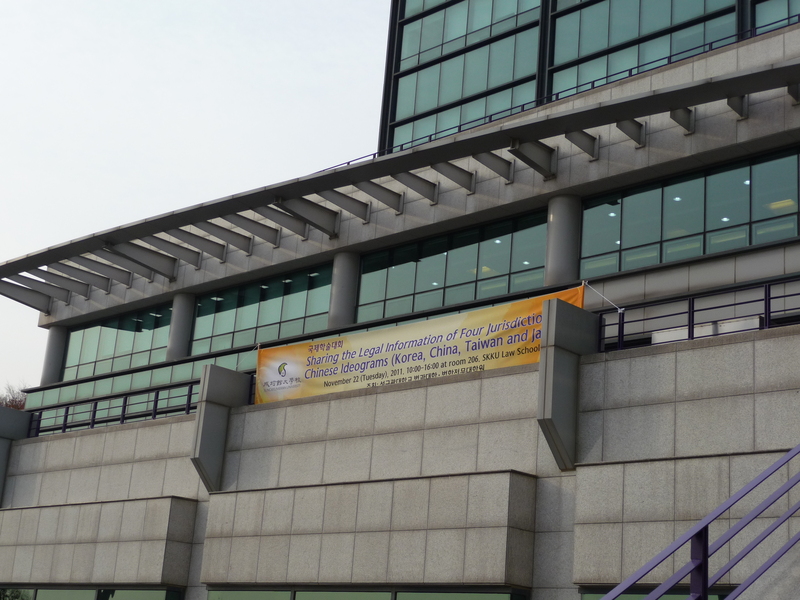 Prof. Matsuura made a presentation as a invited speaker titled “The Legal Information of East Asia and Joint Projects for Comparative Law” at School of Law, Seoul National University, Korea. “Official Gazette, English Edition”（all data) is now able to be browsed in the image format. “Commentaries on the constituion of the empire of Japan”is now able to be browsed in the image format. JaLii invited Mr. Lee dong hee, director of Statutory interpretation & Information Bureau, Ministry of Government Legislation and made a presentation about e-legislation system in Korea. 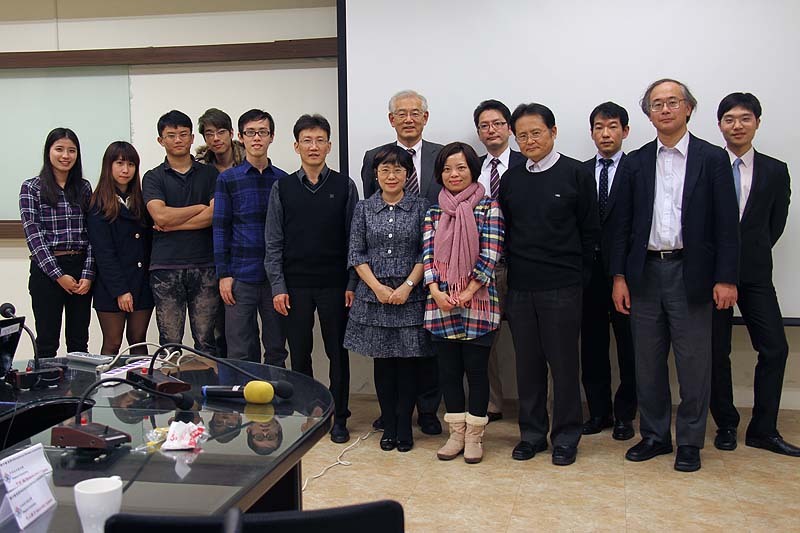 JaLII host a study meeting “Sharing the Legal Information of Four Jurisdictions of Chinese Ideograms（Korea, China, Taiwan and Japan)” by support of Sung Kyun Kwan University Law School. 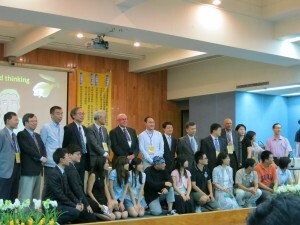 JaLII greatly appreciate the support given by Dean, Professor Sonn and Professor Kwon, SKKU Law School. 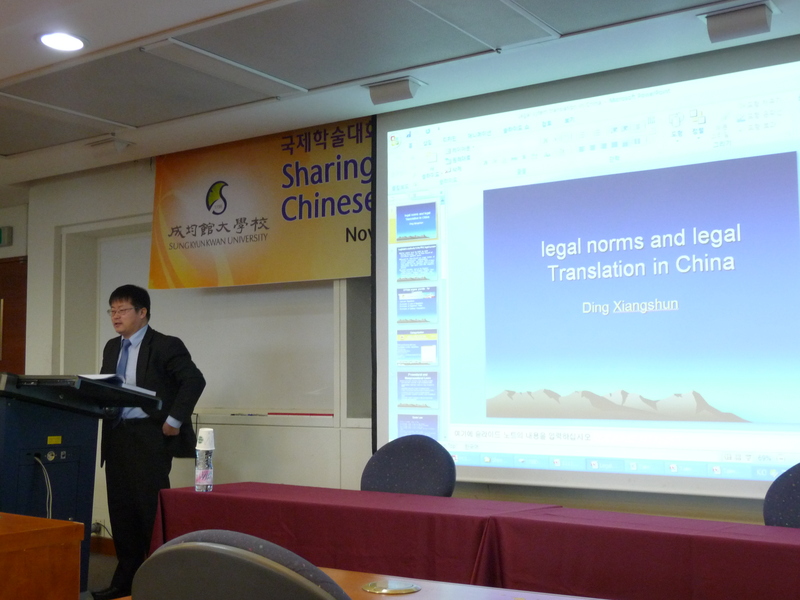 At the study meeting, Professor Shee, National Chung Cheng University, TAIWAN made a presentation titled ” Taiwan KWIC SBD LawPack and to move foreward”, Professor Ding, Renming University made a presentation titled ” Legal Norms and Legal Translation in China”. Assoc. Prof. Kakuta made a lecture titled “Approach to e-Legislation in JaLII” at Lecture Meeting of Education and Research Center for Trustworthy e-Society in Japan Advanced Institute of Science and Technology. Assoc. 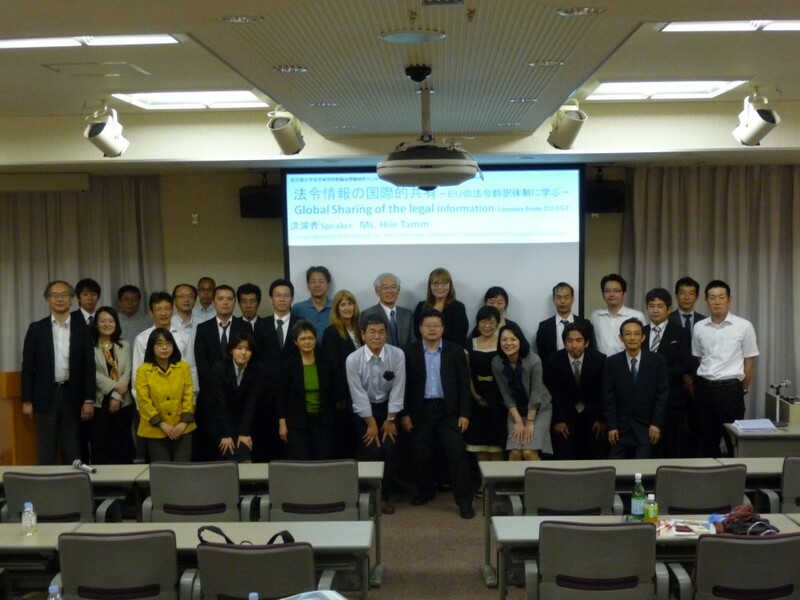 Prof. Kakuta made a presentation titled “A Concept of e-Legislation”, the 11th Study Meeting, the Information Network Law Association Japan at Hokkaido University. Prof. Matsuura made joint presentation titled “LawPack: A New Way of Doing Comparative Law in Contexts” with Prof. Shee, Chung Cheng University at the International Conference “Second East Asian Law and Society Conference” at Seoul, Korea on the campus of Yonsei University. Prof. Matsuura was invited the International Conference “Exchange and Integration of the Contemporary Legal Systems” organized by College of Comparative Law, China University of Political Science and Law, and made joint presentation titled “An Innovative Approach to Comparative Studies in East Asia” with Prof. Ding, Renmin University and Prof. Shee, Chung Cheng University. 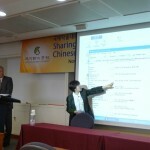 Global Network of Digital Libraries” at the 2011 International Seminar on Digital Publishing and Digital Libraries organized Tsinghua University Library, PRC. 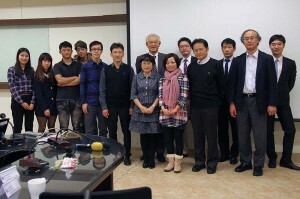 JaLII invited Professor Shee and Professor Hwang from National Chung Cheng University for the research meeting. 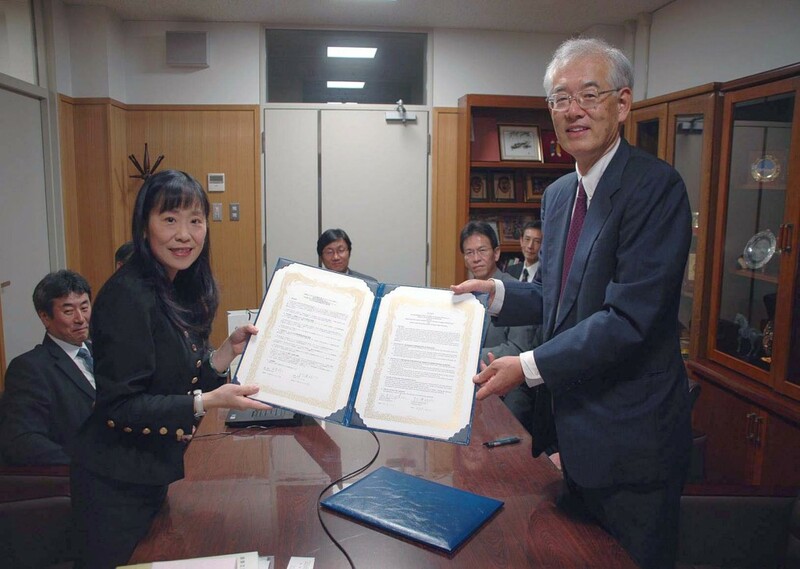 Prof. Matsuura and Asoc. 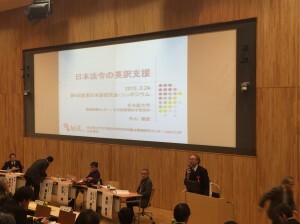 Prof. Toyama attended the opening ceremony of Taiwan LII, and made a presenatation at following round table forum in National Chung Cheng Univ., Taiwan. JSPS Grant-in-Aid for Scientific Research(S) “Development of an Environment to Share Legal Information of Countries of Chinese Ideograms in Plain Language” was issued. JaLII hold an lecture by Asoc.Prof. Yoichi Takenaka and Asoc. Prof. Takeshi Wakao “Application of bioinformatics to comparative study of Ordinance and Rule of local government”. “Code civil de l’Empire du Japon : Livres I, II & III, IV et V” is now able to be browsed in the image format. “Official Gazette, English Edition” is now able to be browsed in the image format. “Code civil de l’Empire du Japon” is now able to be browsed in the image format. 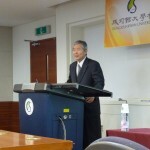 Prof. Matsuura and Assoc. Prof. Toyama joined the workshop at Zhejiang University, PRC. 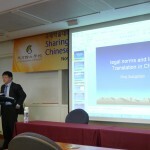 “Japan-China Cooperation in Legal Education and Informatics” and Prof. Matsuura made a presentation titled “Development of a Multilingual Statutory Information Data-base System for the Countries of Chinese Characters”. 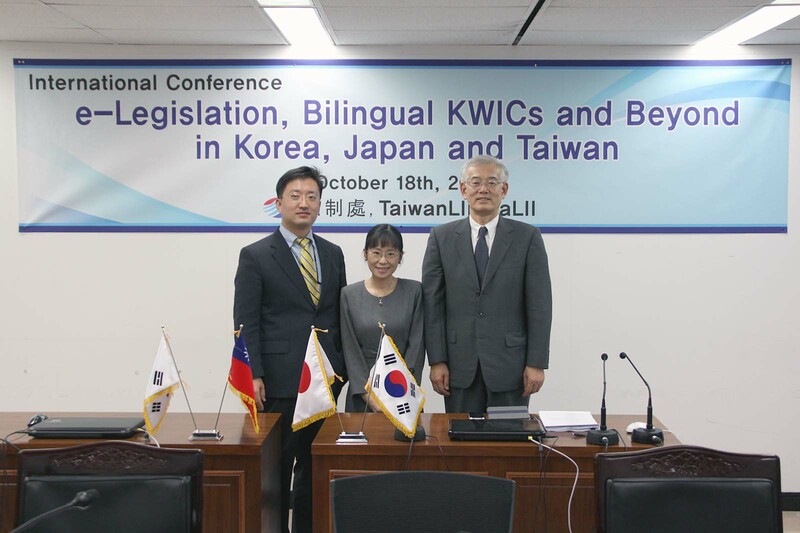 International Conference on e-Legislation, Bilingual KWICs and Beyond was held at Korean Ministry of Government Legislation. JaLII and TaiwanLII agreed to conduct a joint project to share the standard translation dictionaries respectively developed for translation of Japanese and Taiwan laws and the bilingual data of laws of Japan and Taiwan and to promote a comparative study of Japanese and Taiwan law. Prof. Matsuura and Asoc. 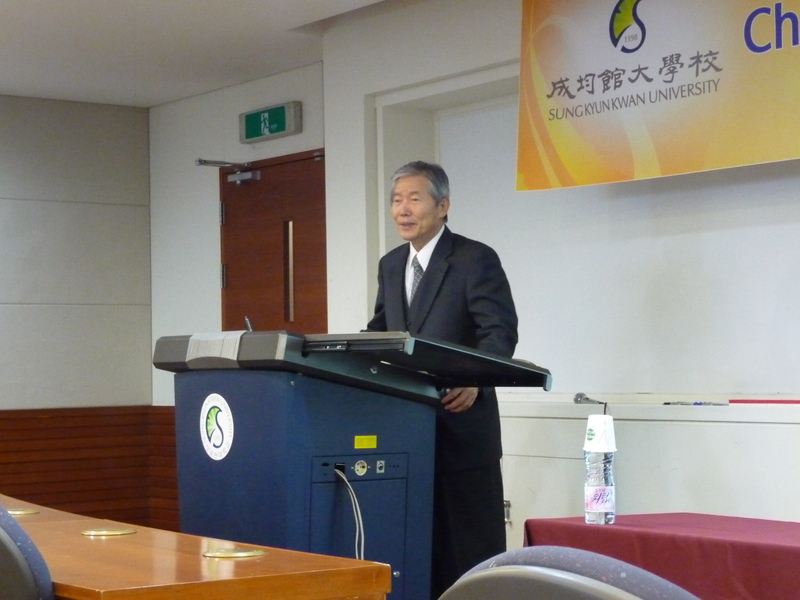 Prof. Toyama delivered their lectures at National Chung Cheng Univ., Taiwan. Prof.Bennett delivered his lecture at JATLAW April Meeting. “Japanese Law Translation” system (Ministry of Justice, Japan.) was launched on April 1, 2009. JaLII developed the system by participating in the bidding.